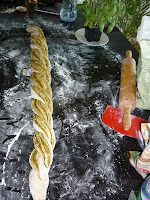 World Bread Day 2012 - 7th edition! 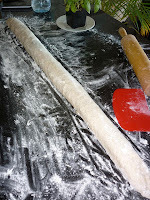 Bake loaf of bread on October 16 and blog about it! World Bread Day, so ....... BAKING DAY! 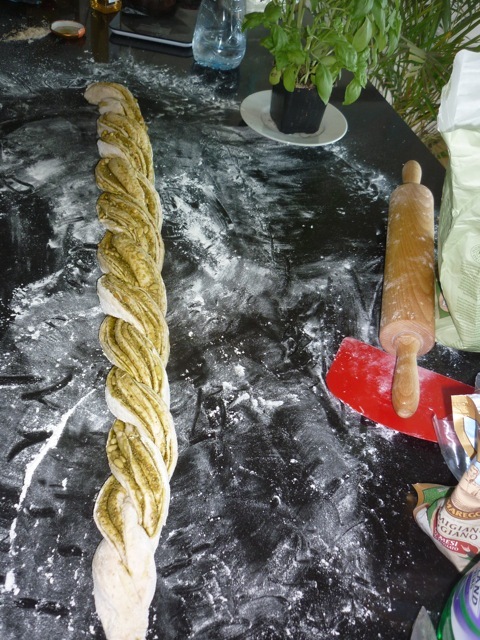 Keen to join the Bread Baking Buddies bake-along, a "Russian Braid" is on the baking menu. 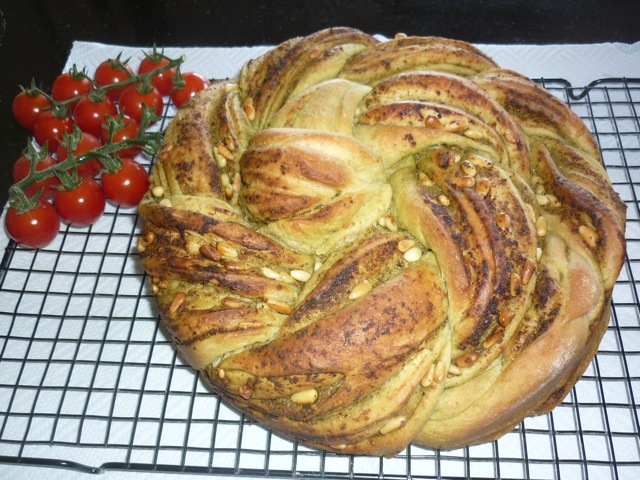 A very impressive looking braided bread with either a sweet or a savory filling. Bread Baking Babe Tanna from "My Kitchen in half cups" provided us with this fantastic recipe. 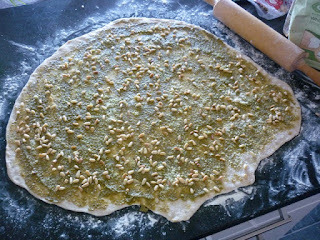 I choose a filling of pesto, toasted pine nuts and parmesan. 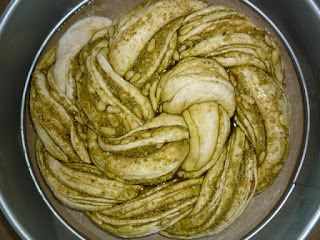 For the dough I used a mixture of white (80%) and whole wheat (20%) bread flour and replaced the canola oil by walnut oil. I also added the one tablespoon vinegar (scary! ); I used sherry vinegar (and thought I kept smelling it ...). Following the recipe was easy and the result is unbelievably impressive! I cannot wait to make a sweet version with a dark brown sugar and cinnamon filling. Jaw droppingly beautiful isn't it. Makes you smile just looking at it and realizing "Hey, I did that." I know what you mean about the vinegar, I left it out the first time but the second time used it. I will be using it from now on. My family and I loved this bread! I'm so glad that with this recipe we learned the vinegar trick, because, like Tanna said, I'll use it from now on. Your rose turned out beautifully and I cannot wait to try a sweet version as well. The savory one was a winner! Your "rose" looks lovely studded with the pine nuts. I never knew about the vinegar but am going to try it with my "dense" breads. Thanks for your nice comments! This was without a doubt a "feel good recipe"! Beautiful, beautiful! 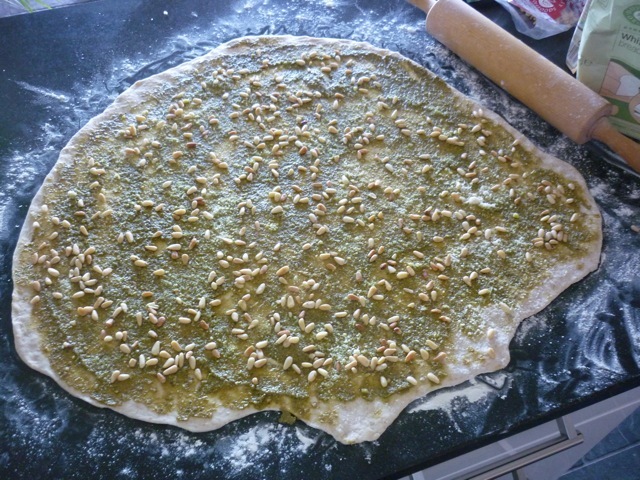 What a great idea to add walnut oil to the dough. I will have to try adding vinegar. I used lemon juice instead of vinegar and have no idea if it made any difference at all.